Exact application rate values must be determined on site. The Kreidezeit Window Care Set is for the maintenance of wooden frame windows treated with Kreidezeit Stand Oil Paints or coloured Wood Lazures. Contains a care soap for gentle cleaning of dirty paints and a care oil for renewing protection and colour intensity. 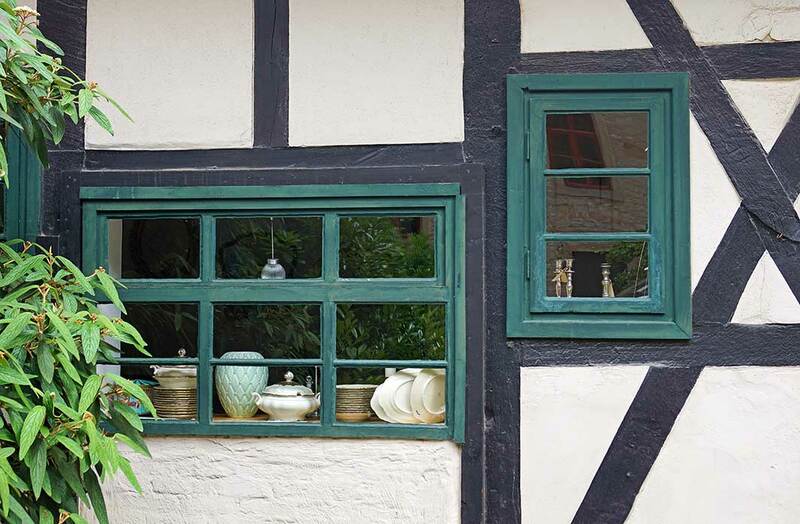 The Kreidezeit Window Care Set is for the maintenance of wooden frame windows treated with Kreidezeit Stand Oil Paint or coloured Wood Lazures. To maintain the protective coat of the surface and its fresh look regular maintenance and care is recommended. Minimal effort needed as renovation coatings are not required for a long time because of the durability of the paint after treatment. When using the product, the complete Product information Window Care Set must be observed. Warning! There is a risk of self-ignition when working materials are soaked with product. Treated surfaces should be visually checked every six months for dirt and damage; treat and clean if necessary. During the half-yearly inspection & cleaning the gloss of coated surfaces must be assessed. Areas that have lost their brilliance must be immediately treated with the Kreidezeit Window Care Set. All areas with a sufficient brilliance should NOT be treated, because too frequent usage on still glossy surfaces can lead to a sticky and greasy looking surface. Kreidezeit Stand Oil Paints and Wood Lazures are environmentally friendly and therefore deliberately contain no fungicides. Even conventional wood coating systems equipped with fungicides commonly show mould (blackening, deep shadows). It is important to check for fungus (usually small black dots on the surface) regularly at least every six months. Wipe off the mould with water and Kreidezeit Care Soap. Because the coated weather bars are the most exposed to the weather, their condition should also be checked every six months. Don’t clean the wooden windows right after installation. Paint and silicon need approximately 4 weeks to dry completely. Please clean the metal weather bar after installation. The drainage slots must not be clogged. Dirt can be rinsed off with a soft sponge and Care Soap (1 tablespoon soap mixed in 1 litre of water). Excessive dirt can be treated with a more concentrated soap solution. As a rule of thumb, maintenance is necessary on sunny or windward sides once a year and on lee sides every 2 years. However, due to weather conditions and exposure these intervals could vary significantly. In principle there are no definite maintenance intervals for the Kreidezeit Stand Oil Paint or Wood Lazure system. Let cleaned surfaces dry completely. Wipe the surfaces that have lost their gloss, especially on sunny or windward sides, gently with a cloth soaked in Care Oil. Wipe off any residue after 10 – 15 minutes with a dry cloth (residue oil can get sticky and very shiny!). The colour intensity will return. The application and drying temperature should be at least 10°C (50°F) over a period of at least 48 hours. Repainting is necessary in the following situations: Stand Oil Paints in the exterior are strongly weathered, the colour has faded away, the wooden surface is visible, the pigments have washed out from the rain. The surface has to be cleaned with Care Soap and still glossy parts should be sanded slightly (120-150 grain). For renovation on Kreidezeit Wood Lazures should be repainted with Wood Lazure interior/ exterior (art. 320) tinted with Kreidezeit pigments up to 175 gram pigment per 1 litre Wood Lazure or with coloured Wood Lazure (art. 480-488). For renovation Kreidezeit Stand Oil Paints should be repainted with Stand Oil Paints -top Coating- (art. D 1600-1612). The weather bars on the sunny sides should be repainted at least every 2 years. If there is no dealer in your region, you can order directly from us under +49 5060 – 6080650 or under info@kreidezeit.de.